Take One, Pass it On is officially over! I had a fantastic time doing this challenge in the fall, it really gave me a lot of options for outfits. S/O to Sarah for hosting this awesome challenge, make sure you drop by everyone's pages who participated and say, "Job well done!". So, to show the challenge off in style, I created a little collage of all of my outfits so you could see the full month together. Look, I even put little arrows so you know how the sequence goes. Thanks for all of your sweet comments this month and support while I wore the same thing every day! Don't forget - Take One lives on each week on Friday's here at AJWC in the form of "Friday Favorites Remix". 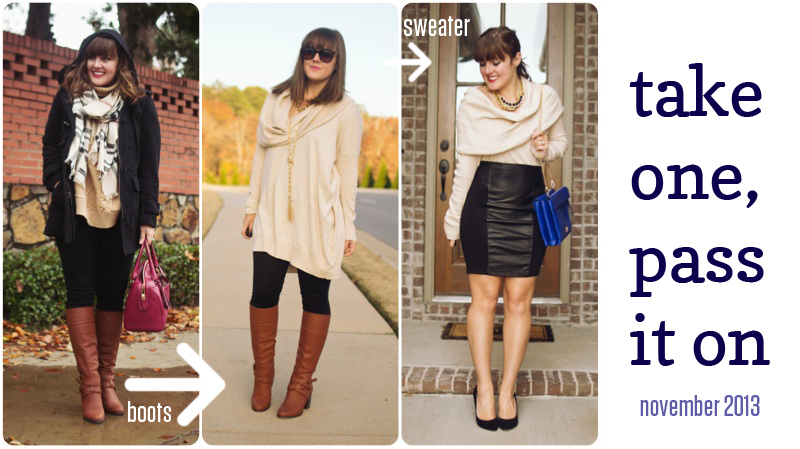 You can join the link up any time you like, just show us how you re-wore one of your favorite pieces each week! Finally, I wanted to take a second and address why I think this challenge is great - and why I think you should do it, blogger or not! It's really easy to get into clothing ruts and feel like you've got a closet full of nothing, so I love the TOPIO challenge because it forces you to look at your clothes differently. Not only have I learned how to mix and match pieces in new ways, I've learned how to shop for pieces that will be ultimately re-wearable. Even if it's just for a day - the next time you're feeling uninspired by the contents of your closet, choose a piece and wear it completely different than you normally do. I think you'll be surprised at how that gets the creative juices flowing!